One of my favorite international cities of all time is Tel Aviv. It ties for first place with Paris. I try to get there at least twice a year. If you have not been there in two years or more……you won’t recognize it. If you’ve never been there, you won’t recognize your vision of what you imagined it would be like. Located on the Mediterranean coast, Tel Aviv is a bustling global metropolitan city packed with some of the best restaurants, chic, luxurious hotels, museums, performing arts centers, shopping and the largest Bauhaus architectural district on the planet! It has the second largest economy in the Middle East, following only Dubai and is the 18th most expensive city to live in. So forget about notions of “the holy land”. Though this ancient seaport is drenched in tales of ancient history – my Tel Aviv is anything but a city out of the bible. Old Jaffa Port: Head to the promenade and make your way down to the Old (now new) Jaffa Port in southern Tel Aviv. This ancient fisherman’s port has been turned into a modern promenade featuring beautiful shops, art galleries and cafes tucked into charming ancient stone buildings. From there you can also walk northeast into the Old City of Jaffa. You will find a winding labyrinth of alleyways dotted with shops and cafes. Go for a walk in Neve Tzedek, Tel Aviv’s Bauhaus district by the sea. Art galleries, shops and cafes abound. Tel Aviv Museum of Art: Since 1932 The Tel Aviv Museum of Art has been one of Israel’s leading artistic institutions of modern and contemporary art, and home to one of the world’s largest collections of Israeli art. Collections include painting, sculpture, prints and drawings, photography, video, installations and architecture and design. 27 Shaul Hamelech Blvd. Herbert Samuel, located in the Gaon House on Tel Aviv’s promenade is the best restaurant I have been to in a long time, including those that I have patronized in New York City. The food, wine, service and ambiance are world-class. The executive chef, Jonathan Roshfeld trained in Cannes and worked his way through Michelin star restaurants in France. The menu has a mix of French and Mediterranean influences. Make sure to be daring and try some of the specials. Also the pasta dishes are a must – all pasta is homemade. 6 Koifman Street. Montefiore, located on the ground floor of the ultra chic Hotel Montefiore, serves what it calls brasserie cuisine under a Vietnamese spell. The bottom line is the food is superb and décor is warm and inviting. At once I felt as though I were magically transported to a Parisian bistro. Every detail — from the leather banquettes and oversized mirrors to the elongated wooden bar and French/Hebrew menu — is utterly sophisticated. 36 Montefiore Street. The Old Man and the Sea (Ha Zaken Vi Ha Yam). One of the oldest restaurants in Jaffa, this hyper local institution serves up some of the freshest fish and seafood around. Upon arrival you will find yourself bombarded with 90 different traditional salads. Make sure to order a whole fish or seafood special, all locally caught. Great for lunch. 85 Kedem Street. And for die hard Shwarma fans, you must stop at Shwarma Shemesh (Sun Shwarma) It’s so divvy we actually ate in the car but the seasoning is sensational and they pack french fries into the pita sandwich. Nothing not to like there. 85 Jabotinsky Street. Numéro13 Concept Store: Chic casual French fashions, accessories, baby clothes and home decor. 13 Shlom Shebazi. 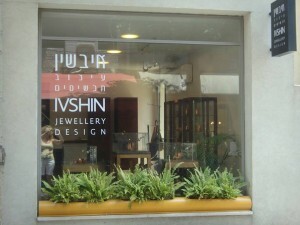 Ivshin: My favorite fine jewelry boutique in Tel Aviv. Owner Orit Ivshin makes the most beautiful designs – her workshop is actually in the store. She ships all over the world and will craft custom creations just for you. 54 Shlom Shabazi. Mik An Mor: Handcrafted leather handbags, belts, accessories, jackets and jewelry. Fantastic one-of-a-kind pieces. 56 Shabazi Street. Hafatzim: Beautiful home décor, rugs, lighting, kitchenware, linens and accessories all characterized by simple, clean lines, natural fibers and materials. 27 Shlush Street. The PhotoHouse: Such a special spot – you will feel the magic as soon as you walk through the door. Opened in 1936, the world renowned PhotoHouse is Israel’s oldest photography shop. The collection of over a million negatives, all taken by photographer and founder, Rudi Weissenstein has won numerous awards and been featured in exhibits throughout Europe and the US. This is a not to be missed experience. A documentary film, Life in Stills, was just released on the life and work of the founder. 5 Tchernichovski Street. I could go on and on but don’t want you to go home broke – so I’ll stop here. The Norman Tel Aviv, a brand new chic, elegant boutique hotel in one of the poshest neighborhood’s in central Tel Aviv. In close proximity to major art galleries, museums, Israel’s National Theater as well as to Shenkin Street and Rothschild boulevard – home to designer shops and fantastic restaurants. Also, just a 10 minute walk to the beach. The hotel is truly enchanting, a fusion of 1920’s grandeur and contemporary elegance. Do have a drink at the library bar before dinner and dine at The Norman Restaurant. The French and Italian influenced cuisine will not disappoint. 23 & 25 Nachmani Street. Hotel Montefiore is located near the Norman Hotel in the center of Tel Aviv opposite Rabin Square. The warm French décor made me feel as though I were whisked away to Paris. The rooms are elegant, modern and beautifully appointed. Each room features the artwork of an emerging Israeli artist. 36 Montefiore Street.